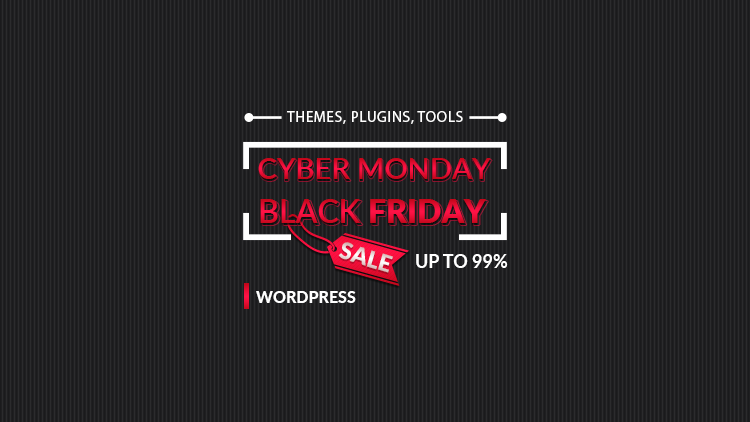 The Black Friday and Cyber Monday 2018 deals for WordPress have started to pop up! Most companies started early, but a few will stick to the official dates. Below, I’ll show you a list with some WordPress deals from the companies that I usually recommend. So, check the list out, and I hope you’ll find something that you need at a good price! For extra details about some of the deals, please check the notes under the table. I usually recommend them for buying domains. Their WordPress hosting looks juicy on paper and it’s very cheap, but it’s not on my recommended list now. With this Black Friday offer, I’m planning to move my testing website there and also host another very light, one-page website. After that, I’ll see if it’s worth getting WordPress hosting there, at least for small, light websites. They are having a once-in-a-lifetime WordPress deal! You can get $9,500+ worth of WordPress products and additional tools for only $99.47! You’ll have access to 18 plugins, 100+ themes, 20 domain licenses, and tools like Hotjar, Boomerang, UptimeRobot, and more! Elegant Themes will offer 25% OFF everything, several products for free, and also release 6 exclusive layouts for their Divi Theme. These layouts will only be available to those who make a purchase during this Black Friday sale! You can’t purchase them after that. Along with those layouts, you’ll also get a lot of free images and design files. Besides their 50% discount, they also offer a Christmas pack for free! A set of postcards that you can present to your clients. WP Rocket also offers 50% OFF on renewals every year, for every customer, so even their normal price is a good deal. I’ve been using it for 3 years now, and I definitely recommend it! You get 5 and a half months for free (35% OFF your first payment). WP Engine’s Black Friday and Cyber Monday WordPress deal is only valid for new customers who purchase any Startup, Growth or Scale plan. HostGator will run daily sales at up to 65% OFF and hour-long flash sales at up to 70% OFF. You’ll also have lower prices on selected domains if you register one with them. If you want to be notified whenever good WordPress deals are available, not just on Black Friday and Cyber Monday, then you can use this link to subscribe to my newsletter. It will open a new tab with a subscription form and info. Make sure you check the “WP related offers” box.